Since World War II, American globalization has increased rapidly throughout the world due to the joint power of effective advertisements, as well as the rise of technology. With that said, these advertisements are tailor-made from an American platform, and many big business companies craft their ideals nowadays to the somewhat defaulted notion of the “American dream”. These effective and very persuasive advertisements circulating in a Web 2.0-minded world have been the major reasons as to why American companies, and more specifically McDonald’s, have conquered culture-centered countries like France. After all, we are ever-evolving individuals who thrive on adaptation and change, and that is the frank truth as to what globalization is, whether France likes it or not. The quintessential French culture has been ridiculed as much as it has been praised, much like the American culture. France, being the oldest established country that ruled for over four hundred years, and America, being the younger one, one would be able to see how these two would clash. However, due to the rise of technology in the United States, more specifically in the Silicon Valley, our Web 2.0 culture graced modern society with the oldest trick in the media book: relatability through propaganda. In Mike Steinberger’s article, “How McDonald’s Conquered France”, the journalist depicts an event in France called the Salon Internationale de l’Agriculture, which basically rounds up all French farmers and their goods and presents it to the French people as a crème-de-la-crème of food markets. However, the Steinberger noticed a startling fact: a McDonald’s Agricultural Hall was standing within the viandes and the fromages, and the organic French chickens that came straight from the farm. McDonald’s had infiltrated even one of the French’s most important agricultural events of the season. According to Steinberger, “Large, colorful placards ringed the display, documenting the amount of French beef, poultry, and vegetables that McDonald’s used, detailing the nutritional value of the food it served, and describing the company’s eco-friendly practices. The words were accompanied by lots of pastoral imagery—cows, potatoes, sheaves of wheat.” McDonald’s is the largest operating fast food chain in the world, as of today. According to the article, “Why McDonald’s in France Doesn’t Feel Like Fast Food”, it operates in 123 countries around the world, and just this week the company said it plans to open another 1,300 restaurants in 2012. Being a corporate giant, McDonald’s has proven to defend its assets through requiring its board of members to have a certain eye for how one would take a globalized company and infiltrate differentiating mediums and cultures effectively. How does one do that, you may ask? I will restate my first point: relatability through propaganda. For example, a highly cultured society (like France) is dominated by their orthodox ideals of haute cuisine. For a company like McDonald’s to prosper, the company must first have appeal to the customers. That’s easy, because throughout the years, McDonald’s has been advertised throughout the world, thanks to American television shows, commercials, movies, etc. The mass media lexicon of America has infiltrated within other cultures successfully due to the rise of the Web 2.0 platform. After this image of globalization infiltrates through one’s head, the company must then appeal to a rather more difficult platform: target its audiences’ cultural heritage. 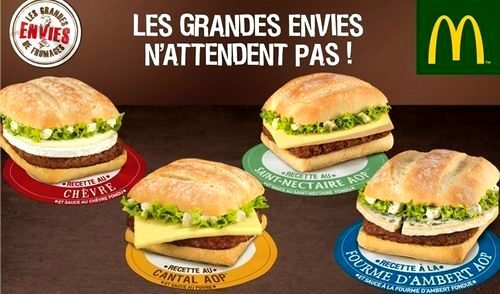 For McDonald’s to thrive in France, the company knew that they had to persuade the dissuaded audience to buy their Americanized food, while still feeling like they were in France. So, what the company did was get rid of the traditional American “2 cheeseburgers and some fries” from their menu, but add French-like choices such as the “McBaguette” (“McDonald’s Offers France a High-Calorie McBaguette”). This is even furthered through France being the only country that I have been to so far, at least, to have an actual McCafe— an obvious play-on words that can either relate to the crowd or have them running from “chez Ronald” (“Why McDonald’s in France Doesn’t Feel Like Fastfood”). Through this cultural relatability, the French are able to sustain an image in their heads that this is a McDonald’s that is very French and has integrated their American-ness into their culture. Customers tend to perform disavowal when it comes to the market; we tend to have selective viewing when buying things. The French, known to be the conquistadors of haute cuisine, are able to relate to McDonald’s due to its ability to integrate French ideals within the spectrum of globalization; the French just tend to look away from it. However, this is a definite generalization, and a very subjective view. The truth is, the majority of the French population love American ideals and globalization, and see that they are not demeaning their culture, but integrating and adapting as all great civilizations do. 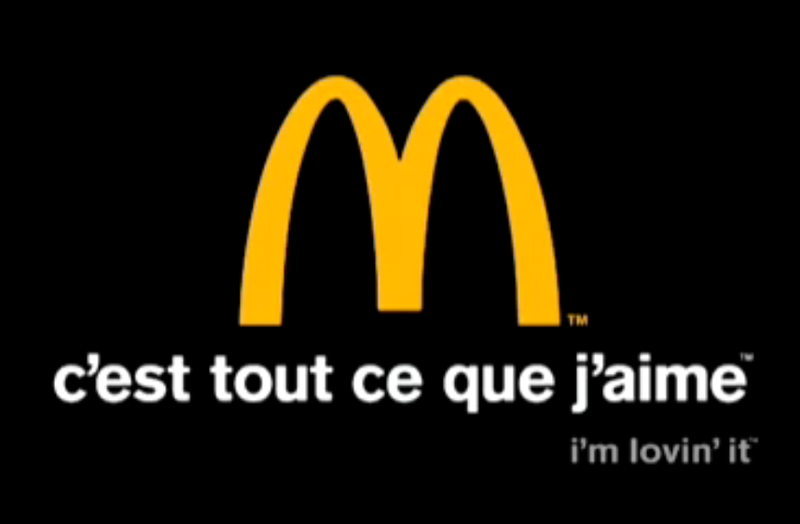 So, yes; I dare say it: The French are fans of McDonald’s. Whoever says otherwise, well, walk a couple blocks from where you stand— you’ll find a gargantuan, yellow-tinged “M” somewhere along the way.